Blog From The North: How's About That Then! For years I’ve reckoned my childhood must have been either utterly deprived or privileged. You see, I can’t remember writing a single letter to Jimmy Savile. I’ve always assumed it was either because my pocket money couldn’t stretch to a stamp, or because my life was so complete, that I never craved a Jim Fixed It For Me badge. I certainly didn’t want any of the things that other children begged him for: like riding in Doctor Who’s Tardis, singing in a studio with Abba, or having a meal on a rollercoaster. What could possibly have been wrong with me? Then, after Sir Jimmy’s death on Saturday, I realised the problem: I’m just too old. The programme didn’t start till 1975, by which time I was already in my 20s. It was my daughter who wrote to Jim’ll Fix It asking if he could fix it for her to marry Mr Blobby. Yet I’ve always felt Jimmy Savile was an essential part of my childhood. I might have been briefly exposed to his weirdness in 1960, through a music show on Tyne Tees Television called Young At Heart, though I clearly didn’t have the heart for it, as I can’t even remember the fact that he changed his hair colour every week. He certainly wasn’t the talk of Priory Junior Mixed. Instead my memories of him begin in my teenage years: Savile was the lucky man who each week on Top Of The Pops introduced me to my ultimate boyhood fantasy, the dance troupe Pan’s People. I adored his unpredictable, mad banter and I was always disappointed when he was deputised by one of the other, blander DJs. Most of the time, I had no idea what he was talking about, but in a world of over-hyped mid-atlantic pretension, his eccentric Northern bluntness was reassuringly grounded. So I can understand the outpouring of national nostalgia this weekend – you’d have thought the Queen had died. 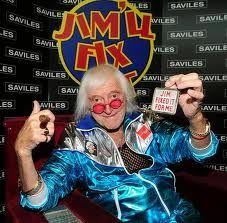 Jim’ll Fix It staggered on until 1994, which is an incredibly long run for a television series, so he must have touched the childhoods of swathes of the population, including the editors of the newspapers and news bulletins that gave his death such prominence. They all grew up, like my older kids, with the sight of that familiar big red chair, his shiny bling-bedecked shellsuits and the sound of his irritating voice; his “How’s about that, then?” catchphrase drummed into their brains every Saturday afternoon. I met him a few times professionally, and actually found him rather haughty and grumpy. I think I’m in a minority here, and my view may have been clouded by the fact that I can’t bear the smell of cigar smoke. But he was selfless in his support of good causes and, in one way, I’m personally grateful to Sir Jim. For he directly influenced my own career path: I have no doubt that Jim’ll Fix It was the inspiration for Challenge Anneka. Both shared the same underlying concept, that the power of television can be used for good, and both put ordinary people at their heart. It’s a formula I still believe in, and it’s sad that these days only cynical talent shows and shock reality docs offer an opportunity for members of the public to get onto our screens simply as themselves. Jim’ll Fix It was the archetypal feel-good show in a period of family entertainment that’s long deceased: these were the days of The Generation Game, It’s A Knockout and That’s Life. He and they will be much missed. 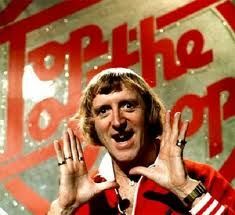 Jimmy Savile and I are also linked by music. A very good friend of mine is a composer called David Mindel, who wrote the iconic theme tunes of both Jim’ll Fix It and Challenge Anneka. David made a lot of money out of Saturday nights on BBC1. I greatly admire him for another achievement: not only did he write the most brilliant, catchy tunes, he achieved a teenage dream that even Jimmy Savile could never have fixed for me: he married one of Pan’s People. How’s about that, then?